Imagine Every Australian Business at your fingertips. Unlimited Use. Unlimited Export. Say Goodbye to List Brokers Forever. Export to industry standard CSV format, open directly in Microsoft Excel. The most comprehensive & up-to-date data you will find in Australia. Unlike expensive list brokers we don’t impose usage limits & time limits on our data. There are no further obligations, nothing further to pay. Including Suburb, State & Postcode. Don’t waste time combing through large spreadsheets to find what you need. 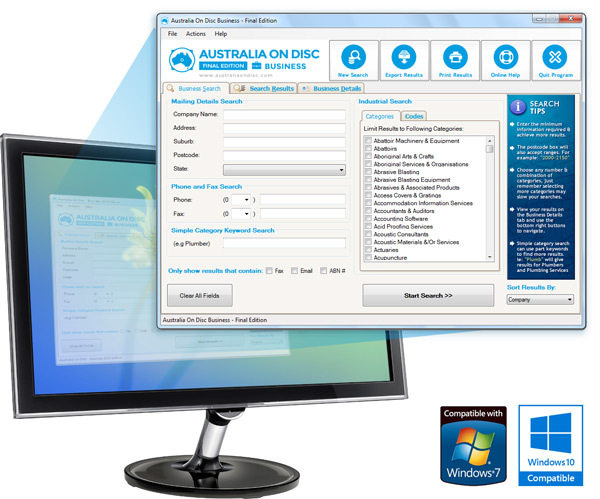 Australia On Disc is easy-to-use software that allows you to target, search & export records from our premier Australian Business Database. Searches can be made by state, suburb, postcode, business category and much more (in any combination you desire). Save time and money – target the results you need quickly & easily. Search via postcode range (ie: 2000-2150), multiple category selectors & an advanced wildcard category keyword search feature (simply type “plumb” and you’ll get results for Plumbers, Plumbing Services & anything related! Simple!). Plus you can filter records that contain email, fax & ABN numbers. You can use AOD for telemarketing call-list creation purposes. You can use AOD data for printing mail-merged labels for promotional mail outs & direct marketing. You can use AOD as a research tool. Join the thousands of businesses saving time and money by using AOD for their bulk list marketing needs. All Industries, All Locations, Everything You Need. 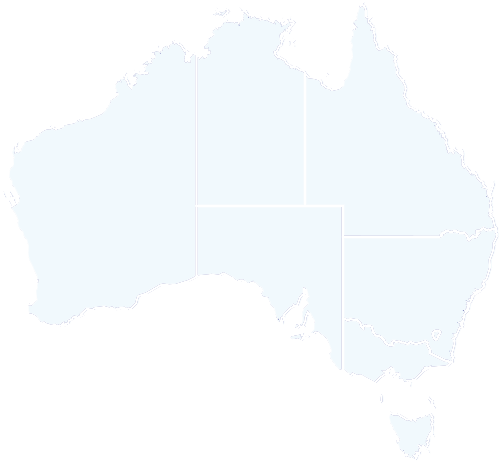 AOD Business covers every corner of Australia. We cover all Industries. Target by Suburb, State, Postcode, Postcode Range and much more. The listings cover the whole of Australia from metro to regional areas across all states. The History of United Directory Systems dates back to 1986. 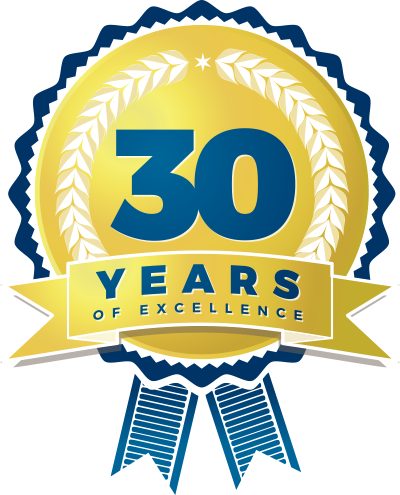 Unlike many other marketing list companies who close business almost as quickly as they start business, Australia On Disc is a brand trusted and respected by thousands of small to enterprise sized businesses around Australia and have been so for 30 years now. Purchase Today, Get It ASAP. Was $895 – Now $595 delivered. Do you offer smaller lists or parts of your database? No. We don’t provide smaller targeted marketing lists simply because we have decided to put the power in your hands to create the targeted lists you need, when you need them. We find all of our clients prefer to have this freedom to create their own business opportunities. As well as this flexibility, having fewer products allows us to pass on huge savings to our customers. Instead of charging expensive list-broker rates (for example: $1 per record with a 500 record minimum) we provide you with lists on demand for one flat fee which proves to be much more cost-effective even for smaller requirements. You can export as much as you want, went you want it – all for one flat rate no matter how many records you require, there are no hidden surprises. Do I need to wash these numbers against the DNCR? In order for a number to be included on the do not call register, it must be used or maintained primarily for private or domestic purposes – this means business numbers are exempt from the DNCR. Government body numbers, emergency services numbers & fax numbers are now able to be entered on the register – this means you shouldn’t need to wash the data from our business database unless you plan on calling these particular numbers. Data exported from our residential database will need to be washed against the DNCR. Simply export the lists you intend to call within the next 30 days & send them to the DNCR to be washed. As usual, the DNCR laws are always subject to change – always make sure to check the ACMA & DNCR websites for the most up to date information & seek professional/legal advice before starting any campaign. Note: We can not wash your numbers for you as the DNCR requires a re-washing each and every month for the applicable numbers you intend to call for that month. It’s a very simple exercise for you to send your lists individually to the DNCR every 30 days to be compliant with the law. Where do you source your data? We obtain our data from various available published sources, supplementing this with local telemarketing campaigns and Internet-based research. We have a data team working throughout the year to update our extensive databases so they are as fresh as possible when you purchase your copy of AOD. How often is the disc updated & what is the price? When you purchase AOD there are Absolutely no further ongoing fees or any other further costs you should expect to pay. The price you see in the cart is fully delivered & we will not expect any further funds for anything in the future except for upgrading/updating to the newer edition (should you wish to do so in the future). We have a special upgrade option available for our existing customers: Every year we completely update the software & databases and you can upgrade to the newer product for a 50% discount when upgrading within 12 months. Some users choose to update each year, others wait a few years and repurchase at the normal price. It’s completely up to you. We believe that’s a fair and flexible update policy. Certainly! You will be provided with full email support 24/7. What's the difference between AOD Business & Corporate? AOD Business contains 1.2 million business records – similar in scope & size to the yellow pages. It does include many emails and fax numbers (and more) and has been in production for many decades. AOD Corporate is a brand new product that contains 25,000+ extended info contacts – including up to 5 contact names at each organisation (managing director, ceo etc) as well as a very large array of other information. It’s a very niche product that would be very expensive to purchase from a list broker for similar data. If in doubt AOD Business is our most popular product and is used by countless professionals year in year out due to it’s sheer size and wide coverage. However if you are looking for specific, extended, niche information about large businesses – AOD Corporate is perfect for you. What are the system/technical requirements? PC with a CD-ROM Drive. Windows XP, Windows 7 & Windows 8 have been tested & working with all versions of AOD. An internet connection is required to activate your product. Should the desired PC not be connected to the internet there is an option for offline activation by using another PC to email an activation file to UDS Support. Australian Credit Card Orders typically arrive within 2-4 working days. Payments usually clear in 24 – 48 hours days and the disc is sent via express post after that. We make a sincere effort to dispatch orders as quickly as possible so you can receive your order as soon as possible, usually within 2 – 3 business days. Australian Bank Transfer Orders typically arrive within 5-7 working days. Payments are manually verified (usually within 4-5 business) days and the disc is sent via express post after that. Overseas orders are dispatched via Express Courier International and typically take between 3-6 business days to arrive in most countries. We make a sincere effort to dispatch orders as quickly as possible. If your order is taking longer than expected please contact support so we can track your package. What is the software licensing agreement? This product is supplied with a standard local site license. This includes use of each disc for one (1) machine/user. Please purchase multiple copies if you wish to run this software on multiple computers. Discounts for multiple copies will automatically be applied in your shopping cart. Note: The license provided with AOD excludes on-selling (in part or in whole) the data or use of the data by any department or third party, outside of the office in which the disc is housed which also excludes inter or intra branch use. A Commercial License is available for such requirements, please Contact Us for more information. Is there a download option? As a matter of policy (due to the size of the products and the risk of fraud) we do not offer a download option. If you have any problems with the installation from the disc (ie: no disc drive or corrupt disc etc) we can provide you with an application download link. This option available to verified customers with a verified address. What opt-in permissions are included? If you are considering using the email addresses within AOD to create a Bulk Email Marketing Campaign, we highly advise to research the applicable email/spam laws before creating a campaign to make sure you don’t get break the law. The emails contained within AOD are ‘found’ contact details aka everything we know about a particular business – which may include email addresses, fax numbers, ABN numbers & more. Just because it exists on our database it does not give you any extra permission to do anything in particular with the data. For example: the laws state that most businesses are exempt from the Do Not Call Register – this means you can telemarket to most business numbers without ‘washing your list’ against the DNCR first. However bulk emailing generally requires email addresses that have opt-in permissions which is usually very expensive & has many restrictions due to the complex nature of keeping each user ‘opted in’ and happy to be receiving bulk email. To reiterate, there are no express or implied permissions included, so it’s up to your organisation to use this data in a legal context & comply with any local laws. In addition to Paypal / Credit Card payments we also offer direct deposit payments into our Australian bank account. This is now all automated through our shopping cart, simply choose the Bank Transfer option when checking out and an automatic invoice will be created for you with payment details. Once you have completed your payment please email us remittance advice / proof of transfer to help speed up your order. Please keep in mind Credit Card orders arrive a lot quicker than bank deposit orders as they clear instantly . If you absolutely must pay via bank transfer and prefer a speedier order you can also make a cash deposit into the UDS account at your local NAB branch. This is a quick option it also clears instantly. Email your your payment reference number and we will dispatch your order via Express Post as soon as we confirm your payment. Simply head over to our Shop, add the products you wish to purchase to your cart and follow the prompts. If you still have questions about the product please contact one of our friendly customer service representatives who can help you with your product enquiry as soon as possible.